OM603 - oil leak from exhaust port with new head! GREAT writeup ! THANK YOU ! . Might you have a link to the $20 M-B tool you mentioned ? . Might you have a link to the $20 M-B tool you mentioned ? 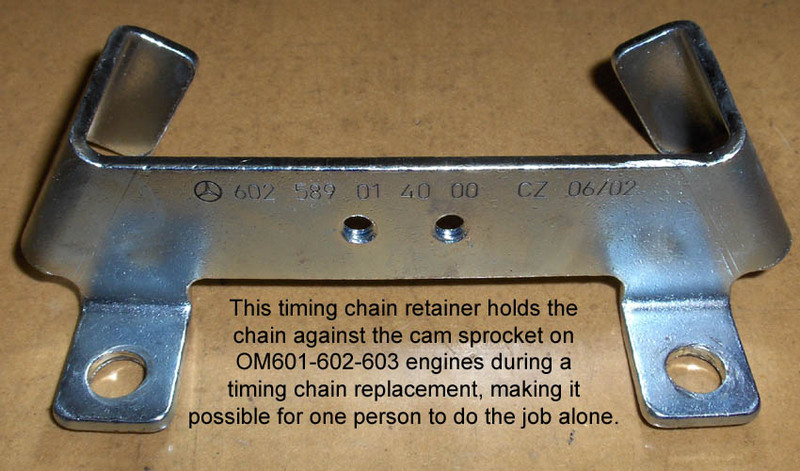 Photo attached below, tool is part number 602-589-01-40-00. However, that $20 price was from 16 years ago. It's not that cheap today. Current dealer cost is $57, most dealers mark up tools 30-50% so plan on $75-$90 or so, and probably a week or two delay if it's coming out of Germany. This tool is shown in the FSM procedure at this link. forgive my ignorance, im a noob when it comes to this but how would you know which piston is TDC if the cam is removed? Last edited by jeremyreuben; 01-25-2019 at 02:11 PM. It should be at TDC #1 before you remove the cam. Then don’t turn the engine. Why would you turn the engine with the cam removed? If you had to, one way is to check for the RIV tang in the IP. When centered, the engine is at about 14* ATDC #1 on the power stroke. Keep track of crank revolutions from there. to replace the valve stem seals without removing the head, the cam and valve springs needs to come off/. to prevent the valves from dropping into the cylinders, gsxr says he turned cylinder #1 to tdc for the piston to hold the valves up in order to change seals, then repeated this process for each cylinder - hence me asking how will i know when the next piston is at tdc. i googled the firing order and the cylinder numbering but didnt find much, anybody here that can please tell me? is the numbering just 1-2-3-4-5-6 starting at the front of the engine? Firing order is a standard inline 6, with 1-5-3-6-2-4. Cylinders are numbered 1-6 front to rear. I did the same thing gsxr did when I changed my valve guide seals. To find the marks to stop at, I stretched a piece of string around the crank pulley and marked TDC and the overlap point. I broke that into 3 even divisions and made marks. Laced back up on the crank pulley, aligned my TDC mark, then scratched marks for the other 2. This will give you marks at 120˚ and 240˚ so that you may do 1&6 at 0˚, 2&5 at 120˚, and 3&4 at 240˚. The collets on the springs can be quite tight, so you need something to support the valve face while you push. Air pressure isn't enough. Some folks are lucky to have a special edition Zundfolge engine with the firing order embossed on the valve cover. I swear I read that in a MB for sale ad! Seriously, it’s on 617 valve covers. I don’t recall seeing it on 603 valve covers. Maybe it’s on the faded decal. This is correct. Also, IIRC, two cylinders will always be at TDC at the same time. So, you only need to move the engine twice, after the initial pair. Replace seals on 2 cylinders, rotate 120° (I think), do the next 2, then another 120°, do the last 2. WARNING: Rotating the engine with the camshaft removed will almost certainly get the camshaft and crank out of sync with the injection pump. And, the vacuum pump spring will push on the IP timer ramps and intermittently yank the chain into the timing cover area. Fun stuff. I'd consider pulling the vac pump before disconnecting the chain. Also pay close attention to the cam removal procedure, if you don't evenly loosen the cam caps, the camshaft can break. After you get the camshaft re-installed and synced with the crank, triple-check the IP timing before you attempt to start the engine. From memory (again, this was ~15 years ago) I had to rejigger things several times to get it all synchronized after replacing the valve stem seals. And as noted earlier in the thread, only use OE/OEM seals with the metal shells.